Celebrate a friend's birthday with a homemade banner! Spell out a name, or "happy birthday" using these templates, and string it up to surprise a special someone. You'll also find a template for a hand-crafted envelope to hold a card. 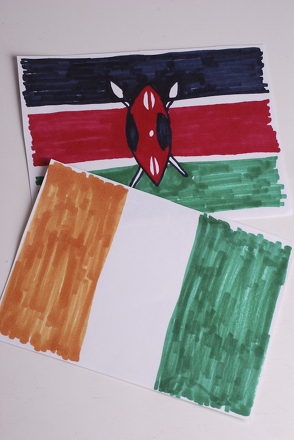 Celebrate African heritage by making an African flag banner. This fun, culturally-inspired art project is perfect for Black History Month. Colour, cut out and construct a homemade banner to celebrate New Year's Eve with some family-fun charm. See how many birthday words your child can find in this word search. He'll practise spelling as he hunts for each one.